Indian Apex Court Clears Dismantling Of "Blue Lady"
New Delhi: The Supreme Court, on Tuesday, allowed a divisive Norwegian cruise liner to be demolished despite more than a year of objections by conservationists who said that the ship has toxic waste. 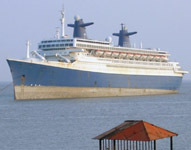 Ecologists, comprising Greenpeace, stated that the 46,000-tonne Blue Lady has over 900 tonnes of toxic waste like asbestos, threatening the physical condition of poorly equipped workers at the Alang ship-breaking yard in Gujarat. In June last year (2006), the court permitted the vessel to enter Indian waters but ruled that it must stay anchored off the coast. The court constituted an expert group to provide guidelines on how to securely dismantle all ships that come to India. Mr. Kapadia told the dismantlement of the ship must be directed by the district collector, the senior-most official in the region. According to the expert group, the destruction of the ship should track certain processes to guarantee worker protection. This comprises refinement before dismantling the ship plus proper disposal of any poisonous waste. In February 2006, the French administration recalled the former aircraft carrier Clemenceau that had been in line for Alang, following a prolonged campaign by Greenpeace, which said the ship contained toxic waste. Greenpeace said Indian shipyards like Alang lack new technology to securely handle toxic waste in ships they scrap.